Jakob and Maria (Neufeldt) Dueck with son Diedrich. Preservings photo. 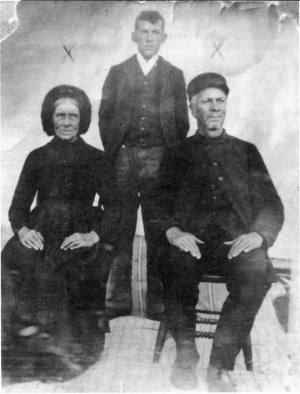 Jakob Dueck: pioneer farmer, born 6 May 1846 in the Chortitza Colony of Russia to Dietrich “Dirk” Dyck (1813-1883) and Anna (Unrau) Dyck (1813-1888). He was the eighth of 12 children. Jakob was baptized on 28 May 1866, and on 25 September of that year, married Maria Neufeldt (1846-1940) in the Bergthal Colony. She was born on 25 August 1846 in the Bergthal Colony to Jacob Neufeldt (1818-1913) and Katharina (Dyck) Neufeldt (1817-1907), the fifth of 11 children. She was baptized on 23 May 1865. Jakob and Maria had eight children, six of whom survived childhood. The family immigrated to Canada in 1874, arriving in Quebec on 27 July. They lived in Rosengart in the Mennonite East Reserve in Manitoba until the village dissolved and they moved onto their own homestead at SW18-6-6E. Their farming experiences included surviving a tornado in 1930 and having lightening strike on two occasions. Jakob died on 26 October 1928 in the Rural Municipality of Hanover, Manitoba. Maria died on 12 August 1940 in Rosengart, Manitoba. They are both buried in the Rosengart Cemetery. Buhler, Linda. "Jakob and Maria Neufeldt Dueck, Rosengart." Preservings No. 13 (December 1998): 98-101. GRANDMA (The Genealogical Registry and Database of Mennonite Ancestry) Database, 5.03 ed. Fresno, CA: California Mennonite Historical Society, 2007: #274825. GRANDMA (The Genealogical Registry and Database of Mennonite Ancestry) Database, 5.03 ed. Fresno, CA: California Mennonite Historical Society, 2007: #274927. Huebert, Susan. "Dueck, Jakob (1846-1928) and Maria (Neufeldt) Dueck (1846-1940)." Global Anabaptist Mennonite Encyclopedia Online. November 2007. Web. 22 Apr 2019. http://gameo.org/index.php?title=Dueck,_Jakob_(1846-1928)_and_Maria_(Neufeldt)_Dueck_(1846-1940)&oldid=94439. Huebert, Susan. (November 2007). Dueck, Jakob (1846-1928) and Maria (Neufeldt) Dueck (1846-1940). Global Anabaptist Mennonite Encyclopedia Online. Retrieved 22 April 2019, from http://gameo.org/index.php?title=Dueck,_Jakob_(1846-1928)_and_Maria_(Neufeldt)_Dueck_(1846-1940)&oldid=94439. This page was last modified on 23 August 2013, at 14:30.